Get ready for the voyage of a lifetime as Israel %26 New Breed take you on an international journey of worship with no limits or boundaries! This ground-breaking record was captured over two nights of powerful and moving worship in Cape Town, South Africa. As Israel %26 New Breed minister to the masses, you'll get a first hand visual experience of what makes this group true worship leaders from deep within their hearts! 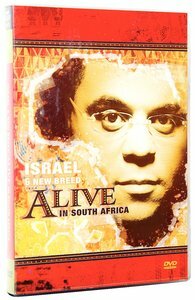 Get ready to feel the true power of worship as you experience ALIVE IN SOUTH AFRICA with Israel %26 New Breed. March 2007 Music Manager's Review: Israel Houghton played at Hillsong Conference last year and introduced Australia to his passionate and incredibly talented band. This fantastic DVD was released alongside his third live album. Israel will be back at Hillsong Conference this year. If You Like: Andrae Crouch, Fred Hammond, Earth Wind %26 Fire, Kirk Franklin. About "Alive in South Africa"